In China’s new era, socioeconomic issues such as a rapidly aging society, an uneasy transition towards a knowledge-based economy, and a highly polluted environment are becoming more important than relentless economic growth and expansion. And foreign investment into China must adapt to respond to these new priorities. In this issue of China Briefing magazine, we analyze macro-level foreign investment trends into China, and how the high-tech sector stands out above others. We then shift our focus to China’s healthcare sector in the context of policy reforms and demographic changes. We also examine how to invest in China’s education industry and how China’s war on pollution introduces new opportunities for foreign investors. At October’s 19th National Congress of the Communist Party of China, Chinese President Xi Jinping declared that China had entered a “new era”. In this new era, according to Xi, China’s economy and society has reached a turning point. After then-leader Deng Xiaoping launched his bold reform and opening up policy in the late 1970s, China experienced economic growth and industrialization at a pace and scale unprecedented in human history. During this period, China lifted hundreds of millions out of poverty, and became known as “the factory of the world” due to its outsized role in global manufacturing. As a result of this breakneck development, China now faces myriad challenges. These include a rapidly aging society, an uneasy transition towards a knowledge-based economy, and a highly polluted environment. In China’s new era, socioeconomic issues such as these are becoming more important than relentless economic growth and expansion. And foreign investment into China must adapt to respond to these new priorities. 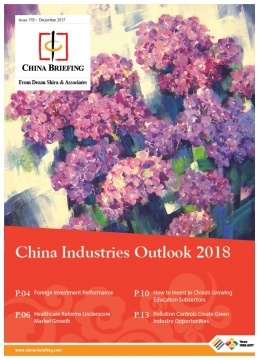 In this issue of China Briefing magazine, we look at the industries that stand to gain from China’s new era. First, we analyze macro-level foreign investment trends into China, and how the high-tech sector stands out above others. We then shift our focus to China’s healthcare sector in the context of policy reforms and demographic changes. Next, we examine how to invest in China’s education industry, which has become a priority for the central government and private families alike. Finally, we consider how China’s war on pollution introduces new opportunities for foreign investors.